The curators of the Biennial seem to be arguing for a serious look at the practice of text-making, that the production, circulation, and look of texts have undergone as much expansion in the past few years as the visual object. Indeed, they are treating some texts as visual objects, and commissioning participants to produce texts or publishing platforms as part of the Biennial. 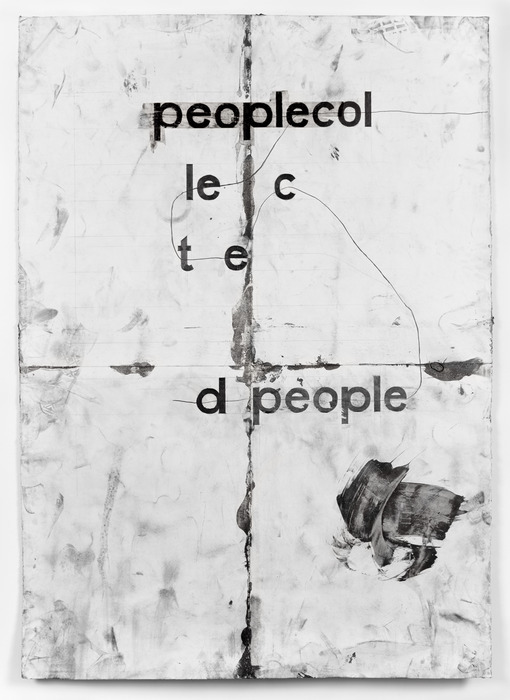 Tony Lewis, peoplecol, 2013. Pencil, graphite powder and tape on paper, 84 x 60 in. ; Collection of the artist, Courtesy the artist and Shane Campbell Gallery, Chicago, Photographer Robert Chase Heishman. Another of the Biennial curators, Stuart Comer of MoMA, invited the publishing house Semiotext(e)—known for publishing Chris Kraus, and The Invisible Committee’s The Coming Insurrection—and the online magazine Triple Canopy to create projects. Triple Canopy has created a unique space for itself within both online publishing—with its dictum to “slow down the internet”—and within exhibition practice. Editor Alexander Provan sees their magazine editions “not as a number of pages bound together and distributed by mail, but as a framework for diverse publishing activities that occur online, in print, in exhibition spaces, and so on.” Last year, the editors created a "School" as part of MoMA’s EXPO 1, inviting a broad range of theorists and cultural workers to comment on the future. Earlier that year, they collaborated with artist B Wurtz on a physical exhibition at Bureau gallery linked to a piece in the magazine. For their Biennial project, Triple Canopy will present select objects dealing with reproduction, drawn from the Whitney’s Garbisch collection of 18th and 19th century American paintings, and copies of other works. A series of written pieces, performances, and discussions accompany the installation, all part of one “issue” of the magazine. They draw a clear line between their work and curating, careful that they are “never providing (cheaper) content to a large-scale institution by accepting the delegation of curatorial labor.” By maintaining the integrity of the magazine and its work, their practice is closer, in practical terms, to artists. Grabner, in “response” to Comer’s selection of Semiotext(e), selected Critical Practices, Inc. Founded by curator and critic Saul Ostrow, CPI creates salons for a small group of invited participants. This classic mode of discussion and idea circulation appealed to Grabner because it takes “a very different path than the ultra trendy independent press." CPI’s contribution to the Whitney will be a conversation series linked to a small-run set of publications. The conversations, in keeping with CPI’s practice, are invitation only; their website makes a point to say that “transcriptions are made available to the participants and will not be posted to any website.” Similarly, the publications will not follow any mainstream distribution routes—there is a news stand in the lobby of the Whitney, and the editions will be circulated in other venues around the city, their locations announced through social media. David Diao, Home Again, 2013, Acrylic and oil on canvas, 108 × 50 in. (274.3 × 127 cm); Copyright David Diao, Collection of the artist, Courtesy of Postmasters Gallery, New York. An emphasis on humanism and the humanities undergirds the curators’ selections. They have avoided marquee names and obvious choices, and included many paintings and traditional practices. 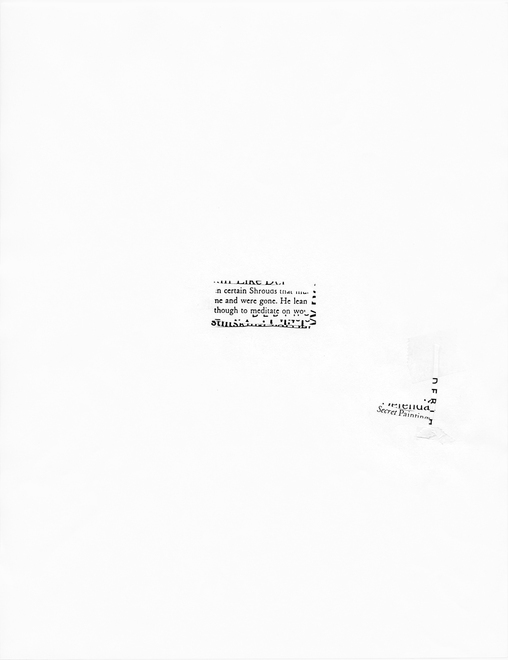 Their text selections do more than examine the relation between text and image—other exhibitions have done that. Rather, they re-focus our attention, in the age of the internet, on its fundamental qualities, arguing for its centrality in an art discourse.